Made from UV stabilized Polypropylene so it is far more damage resilient than metal... even has hail protection. Has a nice sleek and forward sloping surface which is unobstructed (free of speed bumbs, grooves and ridges) so debris moves freely off the gutter... an unmatched self-cleaning property. The opening are precise... small enough to keep gutter clogging debris out, large enough to let some micro debris in, which eliminates mold and constant maintenance issues. The bar grid matrix efficiently separates debrisfrom water while producing a siphoning action to handle the heaviest or rainfalls. Intallation is easy and adaptable to a vast array of roof/gutter styles and compatible to all adjoining matrials. Installed Raindrop gutter guards promote a discreet profile to compliment any home's appearance. 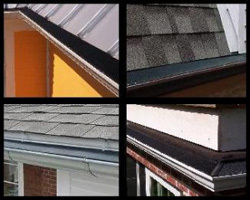 Raindrop® is the most versatile gutter guard available. The “Flex-Flange” makes Raindrop® highly adaptable to work for every situation. Raindrop® is made from its own unique blend of polypropylene. From the street, the Raindrop® Gutter Guard is virtually invisible! Raindrop® Gutter Guards heat up from the sun during the cold months, naturally melting snow and ice to keep water flowing into the gutters year round. Raindrop® Gutter Guard is a whole different kind of gutter protection system that actually does what a gutter guard should. Raindrop® Gutter Guard is the future of gutter protection.